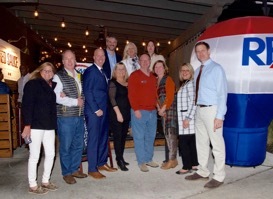 RE/MAX Renaissance Realtors kicked off the Thanksgiving season by hosting a Vendor Appreciation reception at the new Red Sauce restaurant at 14 W. Kent Street on the Northshore. The theme of the evening was, “Thank Your for Being a Friend”. Over 50 guests attended the party where agents were able to personally thank area service providers for helping grow their businesses. Broker, Maria Chavez, said “our agents have had a great year and we wanted to pause and say, thank you”. In the real estate industry, it takes many business partners to get the job done. The event last night was followed by a luncheon on Thursday at The Chattanoogan where owners, Frances Vantrease and Beth Dodson, thanked the agents from both RE/MAX Properties and RE/MAX Renaissance for their support and hard work in year 2017. 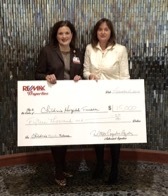 A $15,000 check was also presented to the Children’s Hospital Foundation for the Children’s Miracle Network.